How to Effectively Market and Manage a Private Security Firm aims to dispel the myth amongst security professions that long gruelling hours of work equal success. 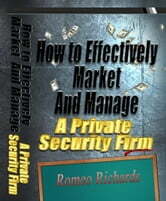 As a professional, success comes from working on not in your private security firm. An acquaintance of mine recently opened a private security firm. From the moment he opened the firm, he has been working ten to fifteen hours per day, six days a week. The last time spoke to him, he told me how happy he was for having that much work at the formative stages of his firm. Succeeding as a private security entrepreneur requires a different thought process than the one currently possessed by the majority of private security entrepreneurs. The first essential thought process that any private security entrepreneur who wants to be successful needs to banish is the belief that mastery in security will result in success. If you choose to master security, you might as well seek employment with another firm, you will definitely be paid more than you are making now pretending to run a business. However, if you choose to be an entrepreneur, you need to understand that marketing is better than mastery. This is not to suggest that you be mediocre security professional. What I am saying is that the prerequisite for succeeding as a private security entrepreneur is the ability to effectively market and manage your private security firm. In other words, mastering the business of security. When you have a successful private security firm, you can hire the best security professionals in the country. However, if you had the best security professionals and your private security firm was struggling, you will lose those security professionals to your competitor that can afford to pay them top dollars. 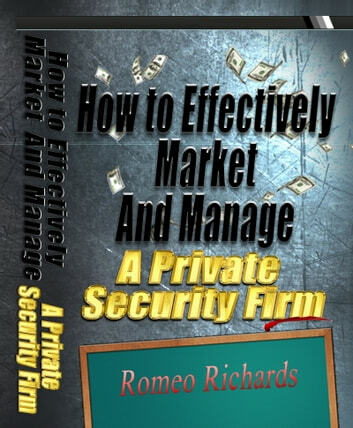 How to Effectively Market and Manage a Private Security Firm teaches private security firm owners how to succeed in the security business. How to Effectively Market and Manage a Private Security provides private security entrepreneurs the type of thinking process required to succeed in the business of private security.